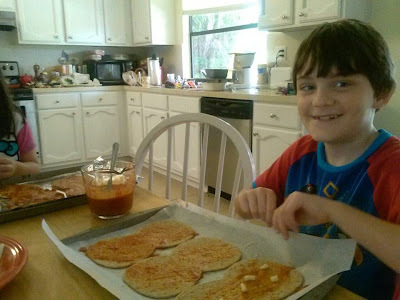 From Nana's Kitchen: This Nana’s “Rainy Day Lunch” is a Full on Pizza Party! This Nana’s “Rainy Day Lunch” is a Full on Pizza Party! A reader sent in a photo of her grandkids enjoying a summer lunch. Because school is still out, she got to babysit them for a week! How do you feel about the whole BACK TO SCHOOL thing? As Nanas, should it make us sad? After all, our place is where the kids go when Mommy & Daddy need a break—sometimes for days at a time! We sure do love ‘em. But how to while away the hours? Should you go out or stay in? 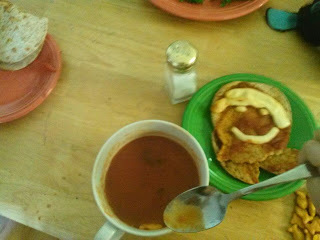 Nana’s Kitchen believes frequent summer rain storms are good reason to stay put! 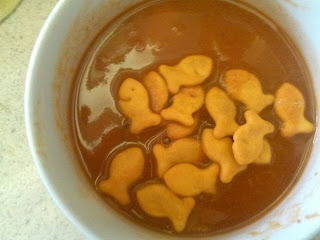 In the spirit of that, TOP NANA put together some ideas for a perfect rainy day luncheon and came up with Flat Out Pizza and GRAM’S Creamy Non-Dairy Tomato Soup—that looks just as it should once the kids get ahold of the Goldfish. The soup is great, I’m told (thanks recipe tester, Jen.) ….but it wasn’t the main event. It was the pizzas…..Having polled some friends on the different activities they do with their grandkids, I was impressed by not just one—but 3 replies of: “we make pizza together.” One Nana did her’s from scratch, sort of like Top NANA’s recipe for Meatball, Spinach and Mozzarella Pizza. 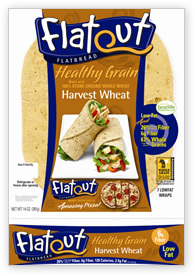 The other Nana, however, took a shortcut and let her grandkids top Flatout (flatbread) wraps with whatever they wanted. You can also use pita bread or a Boboli Pizza Crust. TOP NANA test drove the flatout wrap as a product and loved it. While these (pictured above) are optional for the kind of pizzas shown below, the neat shape of the wraps makes kids feel like they are decorating savory Italian snowmen, with mozzarella, tomato sauce, onions, parsley and anything else they feel like trying out. While the grandkids get busy with their pizza—or anything for that matter—Grandma can get busy on a really easy soup recipe that is creamy, yet Dairy free. Through the cooking camp at Whole Foods, the Nana Network became aware, that you can puree whole grain bread cubes and add them to any soup. It produces the same thick and creamy texture/flavor that heavy cream does. The soup comes together with less than half a dozen ingredients and the recipe makes nearly 2 quarts! So try making a special lunch with the grandkids; for there is only so much Wii and Netflix one can stand. Same goes for iPad, cleaning out closets, and delegating other chores with the promise of ice cream, and that’s why—WAIT A MINUTE! Did I just say something bad about ice cream?! Please forget that part. You can take them out for ice cream right after lunch.